Back when the Moto Z2 Play was announced, we were told that the phone will be available unlocked and through Verizon later this summer. The unlocked version will sell for $499 and it has yet to receive its official launch date, but we now have info that the Moto Z2 Play will be available on Verizon starting today, June 29. If you want to pick up the phone, you can buy it from either Verizon.com or Motorola.com, for a monthly price of $17 for 24 months. The handset will also be available in Verizon stores starting July 6 for the same price. For a limited time, if you buy the Moto Z2 Play, you will also receive a JBL SoundBoost 2 Moto Mod for free. Speaking of Moto Mods, we also have the official launch dates of three of the new accessories. JBL SoundBoost 2 will be available at Motorola.com beginning July 10, at Best Buy beginning July 30, and at Verizon and various other retailers beginning August 10. It will sell for $79.99. 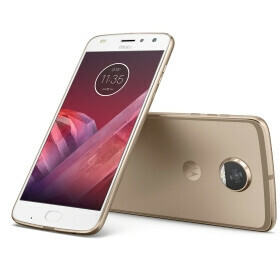 Moto TurboPower Pack will launch at Motorola.com on July 10, it will make its way to Best Buy on July 30, and it will reach Verizon and various other retailers on August 10. It will also retail for $79.99. Moto Style Shell with Wireless Charging will cost you $39.99 and it will only be available at Best Buy beginning July 30. Moto GamePad has yet to receive an official launch date. It will be available later this summer and it will cost $79.99.